More than five years after consumer and industry concerns prompted Monsanto to shelve its introduction of genetically modified (GM), glyphosate-tolerant wheat to the Canadian marketplace, nine grain organizations in the United States, Australia and Canada have officially agreed to support the introduction of GM wheat. More than five years after consumer and industry concerns prompted Monsanto to shelve its introduction of genetically modified (GM), glyphosate-tolerant wheat to the Canadian marketplace, nine grain organizations in the United States, Australia and Canada have officially agreed to support the introduction of GM wheat. Their Wheat Biotechnology Commercialization statement, released in May 2009, notes that wheat is losing ground as a major commodity crop, in part because of superior competition from other GM crops like corn, soybeans and canola. Thus, the aim of these groups is to “…work toward the goal of synchronized commercialization of biotech traits in our wheat crops. …to minimize market disruptions and shorten the period of adjustment.” This has reopened the debate about the potential merits and market acceptance of GM wheat. Second, larger seed and chemical companies that have ignored wheat in the past seem to have developed a new interest in the crop. “They likely haven’t been in wheat up until now because of the poorer return on investment because of bin run wheat and the inability to protect their intellectual property rights,” suggests Wilson. However, he notes that both Dow Agrosciences and Monsanto have established partnerships recently with companies that focus on wheat genetics. response, and the varieties it offers, will be geared towards meeting its customers’ needs. Wilson says he has not had many comments from customers yet about the issue of introducing GM wheat. Further down the supply chain are the processors, transporters, exporters and market users, who must closely consider market acceptance and the logistics of segregation. Here, the issue is more complicated than simply offering both GM and non-GM options. Many factors need to be accounted for, including the costs of identity preservation and who will bear them, the capacity to segregate all classes of Canadian wheat into non-GM and various specialty GM traits, the setting of acceptable tolerance levels and tests for commingling of GM and non-GM wheat, and the availability of GM and non-GM markets, to name a few. Despite this, the North American Millers’ Association, composed primarily of US member companies, is a signatory to the Wheat Biotechnology Commercialization statement. In contrast, the Canadian National Millers Association (CNMA) does not yet have a formal position on GM wheat. According to the association’s president, Gordon Harrison, the CNMA met with others in the supply chain in the fall of 2009 to assist the milling industry in understanding the potential implications of declining producer returns from wheat production relative to alternative crops. “‘Segregate the market.’ It sounds really simple, but it’s really quite complex,” notes Dr. Peter Phillips, a political scientist at the University of Saskatchewan, who studies the economic and regulatory impacts of new technologies. He has held both the NSERC-SSHRC (Natural Sciences and Engineering Research Council of Canada and Social Sciences and Humanities Research Council of Canada) Chair in Managing Knowledge-based Agri-food Development and the Van Vliet Chair in Agricultural Economics at the University of Saskatchewan, and has been studying the debate around GM wheat for close to 10 years. “One difficulty is, the pre-existing system is based on a fairly heavy reliance on bulk handling techniques, which means that we have very large granaries, and we do a lot of blending and pooling as we warehouse, ship and move it through the early stages of processing,” says Phillips. This could make it difficult to segregate GM traits on a large scale. 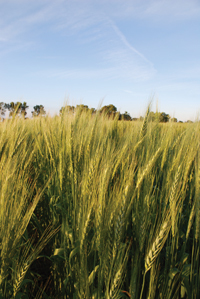 Although there are currently several identity-preserved programs for specific types of wheat, these involve additional costs. So, another part of the debate focuses on who is responsible for and pays the costs of segregating GM from non-GM wheat. “The reality is that the people who would buy and consume GM stuff are largely indifferent between GM and non-GM,” states Phillips. So those who want non-GM will likely have to pay a premium for it. Of course, a big question in this debate is: Who will pay to segregate GM varieties from non-GM varieties? Rather than paying a premium, however, buyers could simply obtain the product from a different market source where GM is not grown. “In fact,” says Phillips, “that’s what we’ve found in products like soybean, canola, even some of the corn. As long as there’s somebody who’s not using the technology, you can buy from them. If Europe, for example, stayed GM-free at the production level, they might export at virtually no extra cost because they’re producing it anyway; they don’t have to spend on control costs.” Premiums are usually only viable if the product type or quality, for example, cannot be obtained elsewhere. Then there are the regulatory difficulties involved in synchronizing the introduction of GM traits. “Trying to get a whole bunch of national regulators to agree to respond at the same time with generally the same decisions is not as easy as you might think,” observes Phillips. Countries vary in terms of regulations, evaluation processes, language translation needs, and other requirements, all of which affect the timing of decisions. Disagreements among member states within political jurisdictions also affect the introduction of GM biotechnology. Two examples noted by Phillips are Australia and Europe. In Australia, the member states enact their own laws for agriculture and other matters that are not controlled federally under the constitution; in the past, some states have prohibited the commercial release of GM crops, even though they have been approved nationally. In Europe, although the member states do not have the legal authority to contravene European Union decisions, they still have some practical capacity to defy those rulings by preventing the sale of GM seed. Ultimately, whether GM traits in wheat are accepted will likely depend a lot on which traits are put into which classes of wheat: the bread, pasta, or feed wheats. “The fundamental question is, where do they put the GM trait?” poses Phillips. “If they introduce it into durum, that’s going to be a big impact because Italy buys a lot of our durum.” And Italy has generally opposed GM wheat. In contrast, says Phillips, much of the feed wheat stays in Canada and the United States, which are markets that already accept GM corn and soybean for animal feed. In terms of the first traits to be introduced, herbicide tolerance might not even be a consideration. Many producers are saying that their fields are fairly clean if they are already using other herbicide-tolerant crops in the rotation. And although producers might like to see traits such as Fusarium tolerance, lodging resistance or drought tolerance that will improve agronomic performance and yield, many proponents agree that traits that add value for the consumer might work better to improve the initial acceptance of GM wheat. These would include traits that enhance the milling properties or health and nutritional benefits of wheat. For example, the development of gluten-free wheat with suitable milling properties would be beneficial for the many people who suffer from gluten intolerance and/or celiac disease. Another trait that might gain easier acceptance could be one that tackles the difficult Ug99 strain of wheat stem rust (Puccinia graminis), which can cause very high yield losses and reportedly may eventually threaten a large proportion of global wheat crops, and thus possibly global wheat availability. Ontario Wheat Producers’ Marketing Board’s statement on biotechnology in wheat can be viewed at www.ontariowheatboard.com/about_bpositions.php .